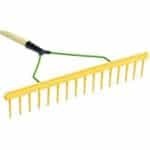 General purpose tough lightweight rake. A replica of the popular Wooden Hay Rake. Very strong and flexible, ideal with sand, soil, gravel, grass and leaves. 64 cm wide and 16 teeth (2cm gap between teeth).